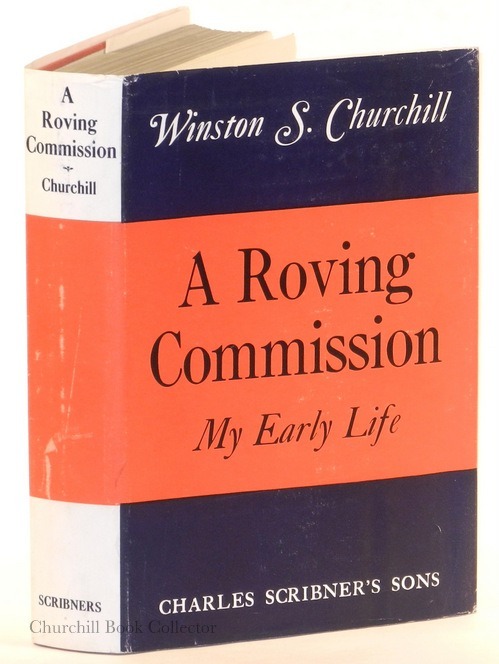 "A Sun that Never Sets": Churchill's Autobiography, "My Early Life"
Winston S. Churchill, My Early Life: A Roving Commission (London: Thornton Butterworth, 1930; New York: Scribners, 1930), numerous reprints and editions since, including e-books. A new edition is expected from ISI Books. A wonderful treat is in store for the first-time reader of the most approachable of Churchill’s books. Harold Nicolson in his 1930 review likened My Early Life to “a beaker of champagne,” and his bubbly expression was not shy of the mark. If the reader was drawn to Churchill by his memoirs of the Second World War, his autobiography will come as a revelation. The war memoirs chronicle a very public struggle against national extinction; the autobiography charts a young man’s private struggle to be heard. But the same style and pace is there, the same sense of adventure, the piquant humour, the ability to let the reader to peer over Churchill’s shoulder as events unfold. …his youth was virtually incomprehensible to most people then alive. 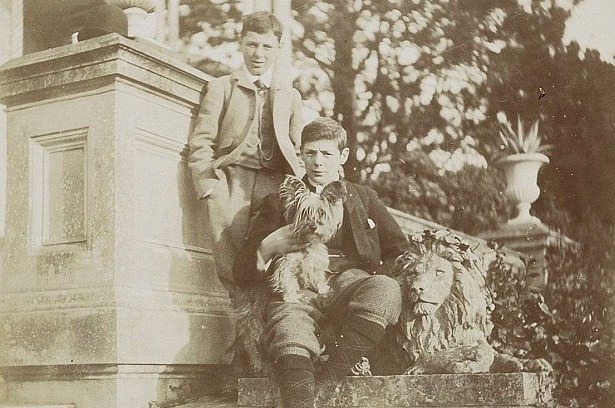 He had been born into the English aristocracy at a time when British noblemen were considered (and certainly considered themselves) little less than godlike. His grandfather was Viceroy of Ireland….These dominant forces—the class into which he had been born—were masters of the greatest empire the globe has ever known, comprising one-fourth of the earth’s surface and a quarter of the world’s population, thrice the size of the Roman Empire at full flush. They also controlled Great Britain herself, to an extent that would be inconceivable in any civilized nation today. One percent of the country’s population—some 33,000 people—owned two-thirds of its wealth, and that wealth, before two world wars devoured it, was breathtaking. The first edition, 1930, in a replica dust jacket. Nevertheless, Churchill had little handed to him, once family influence had placed him where he wanted to be. He could not have embarked on those thrilling war junkets abroad without the influence of his mother and other great personages; but once there he was on his own, and he acquitted himself well. He records these experiences in words which will live as long as any 20th century author is read. My Early Life begins with Churchill’s first memories, of the “Little Lodge” in Dublin where his father lived as secretary to his grandfather, the Duke of Marlborough. Winston’s description of his nurse, Mrs. Everest, is heartwarming; impressions of his schools may be familiar to many who were sent away to school. The story of his years at the Royal Military Academy; his adventures as a war reporter in Cuba, India and South Africa; and above all the famous charge of the 21st Lancers at Omdurman, are elegantly written and will hold the reader’s attention to the end. Here and in his later account of entering politics and Parliament, we can see Churchill’s emerging political philosophy, studded with remarkably advanced views on British society and the Empire. The text was not entirely fresh when the book appeared in 1930. 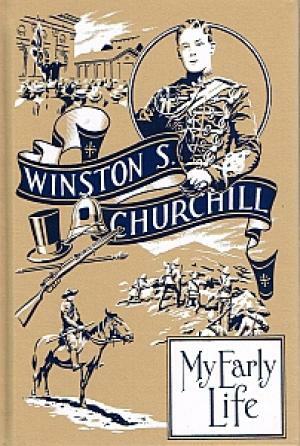 Churchill had been writing autobiographic books since 1898. But the book melded his experiences together, added a lot, and had a huge printing over the years. It has been reprinted in over forty editions and countless impressions. There is a copy for every reader, be it a cheap paperback or a rare first edition. 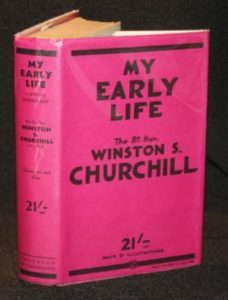 It is notable that My Early Life was one of the two Churchill works excerpted by the Nobel Library—for Sir Winston’s 1953 Nobel Prize in Literature. It presents Churchill at his dazzling best as chronicler and memoirist, written at a time when he was freshly entered in the political wilderness, when most people including himself considered that his political career was over. —from Richard M. Langworth, A Connoisseur’s Guide to the Books of Sir Winston Churchill (London: Brasseys, 1998, reprinted 2002). My Early Life was published on 20 October 1930, almost a year before the last volume of The World Crisis, and by the same publisher, Thornton Butterworth. 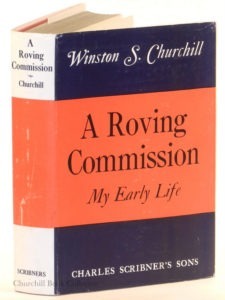 The subtitle, “A Roving Commission,” was taken from the first chapter of Churchill’s 1900 volume Ian Hamilton’s March, itself repeating an earlier novel by G.A. Henty, one of young Winston’s favorite authors. In the American edition, published by Scribner’s, the titles were at first reversed. We are soon to see a scholarly new edition by the Intercollegiate Studies Institute, edited with footnotes and a new foreword by James W. Muller. Churchill’s dedication of My Early Life “To a new generation” confesses his view that he had given a picture of a distant time. If the years 1874-1908 was already long gone in 1930, how much farther away they seem to us now. 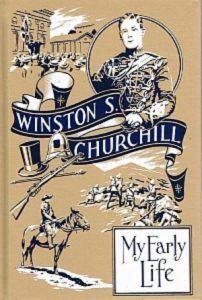 Churchill however recommends it to modern readers as “ a story of youthful endeavour,” which he has “ set down candidly and with as much simplicity as possible.” And youthful endeavor is never dated. Churchill’s account of childhood, school, the Army, and his first arrival at the House of Commons never flags in its interest or importance. No matter how he is judged (and there are many critics) the fundamental brilliance of the author is a sun which never sets. My Early Life embodies not only the forgotten world of Victorian Britain, but also the restlessness of a genius marking his time uneasily, awaiting what he always felt must come to him in future times. Yet even at the time of its writing, Churchill could never have foreseen the enduring weight of Fortune which was to settle upon him. Fine and interesting as the My Early Life is, there is one small drawback to seasoned readers. Some of what Churchill sets down had appeared among the pages of his first books. This is retrospective writing, going back to his first great essays. It would be unfair to say that we are faced here with a “hash up”; but I felt disappointment to have it end at what was then his life’s the half-way mark. Just as we are expecting the author’s politics to entertain us, we are hurried backwards to tales already told in the Malakand Field Force, The River War, Ian Hamilton’s March, and his escape from the Boers in London to Ladysmith via Pretoria. It is not quite the same story, of course. Describing his escape in 1930, Churchill was freer to name those who had helped him in 1900. The ebullience of the author sweeps away repetition as the old tale comes alive again. And this is a tale well worth reading—or re-reading. My Early Life will always be, I believe, the most readable of Churchill’s books. In the Phoenix Park there was a great round clump of trees with a house inside it. In this house there lived a personage styled the Chief Secretary or the Under Secretary, I am not clear which. But at any rate from this house there came a man called Mr. Burke. He gave me a drum. I cannot remember what he looked like but I remember the drum. Two years afterwards when we were back in England, they told me he had been murdered by the Fenians in this same Phoenix Park we used to walk about in every day. It was at “The Little Lodge” I was first menaced with education. The approach of a sinister figure described as “The Governess” was announced. Her arrival was fixed for a certain day. In order to prepare for this day Mrs. Everest [his nanny] produced a book called Reading Without Tears. It certainly did not justify its title in my case. My nurse was my confidant. Mrs. Everest it was who looked after me and tended all my wants. It was to her I poured out my many troubles, both now and in my schooldays. Before she came to us, she had brought up for twelve years a little girl called Ella, the daughter of a clergyman who lived in Cumberland. “Little Ella,” though I never saw her, became a feature in my early life. I knew all about her; what she liked to eat; how she used to say her prayers; in what ways she was naughty and in what ways good. I had a vivid picture in my mind of her home in the North Country. I was also taught to be very fond of Kent. It was, Mrs. Everest said, “the Garden of England.” She was born at Chatham, and was immensely proud of Kent. No county could compare with Kent, any more than any country could compare with England. As for France, Mrs. Everest, who had at one time wheeled me in my perambulator up and down what she called the “Shams Elizzie,” thought very little of it. Kent was the place. Its capital was Maidstone and all round Maidstone there grew strawberries, cherries, raspberries and plums. Lovely! I always wanted to live in Kent.